In 2010, Congress named June 27 PTSD Awareness Day. In 2014, the full month of June was designated for National PTSD Awareness. The purpose of these observances is to educate the public on the signs of PTSD and encourage people suffering from the condition to seek help. Post-traumatic stress disorder (PTSD) is sometimes called shell shock due to its initial association with traumatized military veterans. However, many different types of situations have the potential to cause PTSD. These include car accidents, natural disasters, terrorist attacks, an unusually difficult birth experience, and physical or sexual abuse. Gender. Women are twice as likely to develop PTSD. Family history. Anyone with a close family member who suffers from PTSD faces an increased risk following a traumatic event. Prior psychiatric history. A past diagnosis of depression, anxiety, or other mental health issues can indicate a diminished ability to cope with stress. Lack of social support. People who don't have family and friends to provide emotional support may experience a harder time recovering from a traumatic event. Poverty and/or lack of education. People with fewer resources to handle stressful situations are more vulnerable to PTSD. Intrusive memories. Those with PTSD may suffer flashbacks or recurrent, distressing memories of the event. Negative changes in thinking or mood. PTSD sufferers may feel hopeless, emotionally numb, lose interest in previously enjoyed activities, withdraw from relationships with loved ones, or be unable to experience positive emotions. Changes in emotional reactions. Those with PTSD may have trouble sleeping, sudden onset aggressive behavior, difficulty concentrating, have unprotected sexual encounters, or abuse drugs and alcohol. Avoidance. 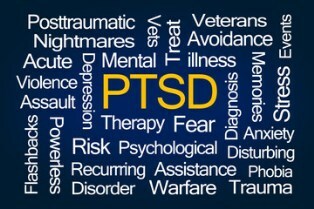 Those with PTSD often avoid people, places, or activities associated with the trauma. To be considered PTSD, symptoms must last for one month or more and be serious enough to interfere with daily functioning. In most cases, symptoms appear within three months of the triggering event. These symptoms may vary in intensity over time and may be triggered by the anniversary of the event, contact with a person associated with the event, or sights, sounds, and smells associated with the triggering event. Children with PTSD experience many of the same symptoms as adults, but they may also act out trauma through play or experience separation anxiety when apart from caregivers. Regressing in developmentally appropriate behavior, such as bed wetting after being fully potty-trained, is another common sign of PTSD in children. PTSD can't be cured in the traditional sense, but it can be managed with psychotherapy. Adults may be treated in individual or group therapy, while children may attend play therapy situations to cope with their PTSD. Medication isn't needed in all cases, but antidepressant medication can help some people feel more like themselves again. Sertraline (Zoloft), Paroxetine (Paxil), Fluoxetine (Prozac), and Venlafaxine (Effexor) are the most commonly used medications for PTSD treatment. Alternative therapies such as meditation, massage, mindful breathing, and yoga are often used as part of the self-care plan for PTSD sufferers. Making efforts to eat a healthy diet, exercise regularly, and get enough sleep can also help ease some of the symptoms associated with the condition. If you believe you might be struggling with PTSD, your physician can provide an initial evaluation and referrals to appropriate resources. If your PTSD was caused by a car accident, a work-related injury, or medical malpractice, compensation may be available to pay for your treatment. Contact us online or call us directly at 318.588.6303 for your free, no obligation consultation.